HAVE MADE USING OUR LEATHER AND ACCESSORIES. SEND YOURS IN! Sandra Terry Has an Etsy Store! Check Out JA Sigle, Bootmakers! From Barbara Moore at JA Sigle: The lace up packers are for a welder. They are a size 15 and have a special prosthesis inside of the right boot that we also made. The leather is the Cinnamon Cowboy, he loves it! We had a wrangler from the RRL Ranch come in and liked the Cinnamon Cowboy so much he wanted a pair of boots out of it too! deconstruct and rebuild a Jordan sneaker with super high quality materials. Here are some pictures. Thought you might like to see!" Vincent made this excellent bag! He says: "I love your products and watch for updates on new leathers coming in. I ordered a few times but also I pass along links for new stock items to my friends. I even ordered a nice 12 mm arch punch to punch out .472" wool felt wads for cap 'n ball revolvers. TGreen made these carry all bags! "I buy from you often. I love the leather you have so much and its affordable for a small business like ours. On our site we have a lot of bags and wallets, even a tiny cement planter that I wrapped with scrap." C. Cantrell picked up one of our panels of Wichita Falls cowhide, from our Scrap Leathers page. Doesn't look like scrap anymore! Products used: Seiwa Tokonole to smooth the edges and the rough side of the leather. Rachel Legloahec (appeared on 'Iron Chef') is a chef, and skilled leather crafter making custom knife rolls and bags for chefs. If you're in the biz, get outfitted the way you should be outfitted - with stuff from Weft & Warp! Dear Brettuns Village People: I just received the hides that I ordered and wanted to thank you for throwing in the half hide and the one with the hole in the middle. hides with a design from that period and using them as upholstery for the seats. I did a sample one which is in the picture and now that I have the rest of the hides I will finish the rest. I think it looks great. I needed 7 more that matched in color and out of the ones I got that will be possible with no trouble. I appreciate who ever did the picking out. Hey there: Just wanted to thank you all for the great leather I recently purchased from you, the Crazy Horse Dark Tan. (dresser valet) last night and I love it! 100% hand stitched. I wish I would've started playing with leather years ago! Thanks again for a great product and prompt shipping. I will be doing more business with you all soon! Peter R. Says "This is what I make with your leather:"
Customized, hand made, ornate and beautiful floggers to suit any customer - and their made with good leather! These are a few things I've made with materials acquired from you fine folks! Thank you for providing such nice materials and tools at the amazing prices you offer! and longer wear. The trim was made out of 2 to 3 oz. veg tan. The boots were all hand stitched and the trim was hand tooled and dyed. Drexel Student Does Fine Work! that my piece of furniture was very appreciated and that I got an A+ in that course. I attached some pictures for you. Again, thank you very very much! 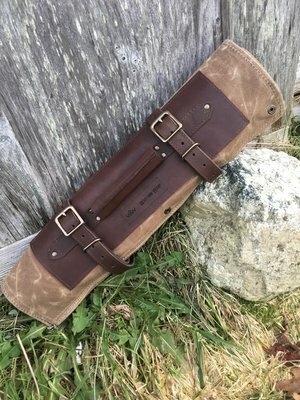 Fine leathergoods, hand crafted in Maine! 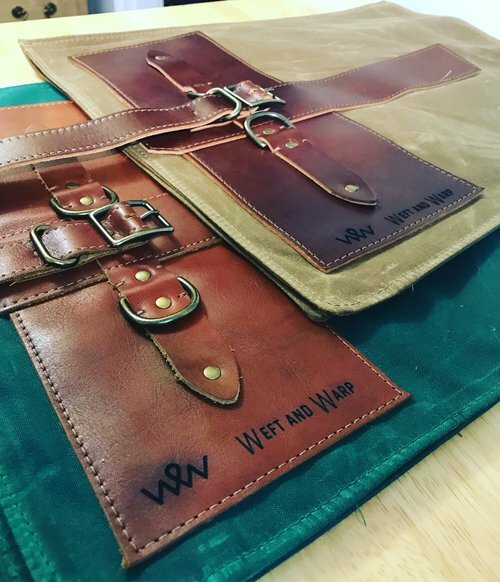 been over 10 more bags and satchels, each one an improvement over the last thanks to you all making leatherworking affordable. I used the piece of leather you sent me to fancy up my bookcase. I had my doubts as to whether this would work or if I'd be ruining a perfectly good piece of furniture. My wife said, "Yeah, I thought you were pretty much going to wreck it." But, to everyone's astonishment, it looks great. Thank you. I've attached a couple of photos so you can see for yourself. Hi Churchill & Co, thought I'd show you what I ended up doing with the coal and denim garment sides and the "heap of sheep" black skins that I got from you earlier in the year. I do costuming and leatherworking on the side (I'm a journalist by trade) and I'd like it to eventually be my main gig, so I turned myself into a walking billboard for my "business" at Comic-Con! hand baseball-stitched at all the seams - and yes, it's functional lacing, if I ever go insane and decide I feel like removing the sleeves for an afternoon in the sun. Just look at what he does with our leather! Luksin is a design co. that holds earth and ethics close to it's heart, right next to passion for design. on the coast of Maine, and garment dyed in small batches in Maine or New Hampshire. Click here to visit Luksin, one of our leather customers. Click here to visit Luksin's Etsy store. 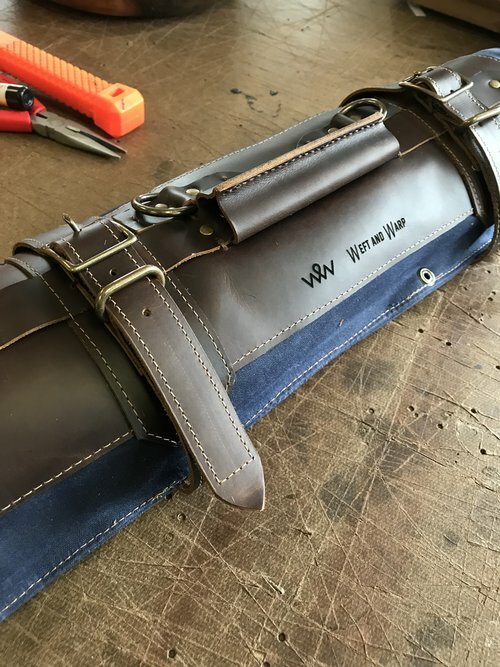 I thought you might enjoy these pix of a quiver project I just finished with material I bought from your store. The fur is from the Nutria furs you sold some months back, the body leather and lace is from your Bourbon sides. The hardware, D Rings and spring clasp were also from your stock. I ordered a side of the Wichita Falls and a couple pieces of the chestnut colored book binders pigskin that you had. together over the last few weeks. I just wanted to say thanks for the leather, I really like the Wichita Falls sides! This holster is made from the North of Cordovan strips I received last week. I haven't tried dying it yet, but so far it's been superb leather for holster-making. A Great Source for Collars and Leashes - and they're in Maine! That box I got from you has lots of good leather and I plan to use it well. around a torso that belonged to some guy with no body fat. Incredible. Jamie says he can make you one of these if you want to drop him a line. This box is made from quarter sawed Red Oak. The outside panels are covered with 100% 18oz Hemp. The lining is 100% wool felt over a Spanish Cedar frame. The handle is 100% Brettuns Village. That yellow lizard print leather didn't look all that promising when it left here. Patricia McDonald, a Mainer, had the vision that we didn't. Fabulous! Below are more items made by Pat - some great skillet handle covers and a backpack! "Hey, I noticed you all had a spot on your website showcasing some of your customers' finished projects. Maybe you'd like to put some of these up? I'll admit the mask is a bit much, haha. I started working with leather a couple years ago and you guys make getting a hold of what I need easy. I sew everything by hand right now, but maybe sometime I can justify getting a machine to do certain things with. Just in case you want to put it up, this is where I sell some of my stuff "
Made from our Black Oil Shale leather by Juan Martinez Navedo. "Great leather, Dyna Solo Bags. If someone has an inquiry they can e-mail me. Hey! I just finished the first piece of my armor thanks to the uber fast shipping of the spiffy "Midas" side. Just a simple clamshell bracer to see how it came together. The leather is perfect and I can't wait to make more with it! Some of our Trunk Parts Are Crossing Over! K. Hesketh (UK) found innovative uses for our trunk handle brackets and reproduction travel labels. You can find these and many more trunk and case parts right here. Posh Pockets are uniquely designed and individually crafted by artist Mary North Phillips. many with interior leather pockets and some with detailed, hand-stitched accents of imported glass or pearl beads. Annemarie Feld creates amazing works of wearable art, and there's some Brettuns Village Leather in there! Eco-friendly handbags made from reclaimed materials. There are several handbag styles to choose from. Each bag is slightly different from the next as the materials are rarely exactly the same. Handbags are designed to have a clean modern style. The minimalist designs are born out of my desire to show that recycled can look fresh and refined. Express your individual personality and go green with a handbag from City Kitty. Good old Brettuns Village Trunk Shop makes leather trunk straps that look pretty nice, and they're good for more than just holding a trunk shut. Here's a set being used to hold a storage box on a sweet ride. Hi Churchill: I just wanted to send you the pictures of the stuff I've made from that North of Cordovan strip I ordered. They're not the greatest, and I'm certainly new to leathercraft, but I'm pretty proud of them anyway. I made a single layer belt for my best friend, a double layer belt hand-stitched with hemp for my farmer cousin, and a key keeper to go with it. I just wanted to share what we did with the 5 hides I purchased from you several months ago. These are some of the pictures from the interior of my Cessna 172. The plane will probably be featured in several articles in Cessna Owner Magazine at the beginning of 2010.
has used on the country music stars coaches in the past 20 years. A while back I ordered some of that yellow lizard leatha. I then realized I need a small patch of white deer skin and you so honorable sent me a chunk in the mail. You made a project possible for me and I wanted to send you a few pics of the piece I made. It is a fighting belt for a local sword fighter. It is lined with steel plates to protect his kidneys and lower back. Hello Churchill! I'm sending an image showing a picture frame I've made using the antique upholstery tacks I bought from you. Amazing Piece I feel like I gave birth upon completion! I'm going to order 200 more of those tacks. Will look through the site and see what else I need. Hope your well, I hear spring is on the way....no more -24 degrees here in Canada! From Michael Snow - Mr. Baseball! So, Who Buys Those Weird Fish Skins Anyway? My project: creating leather case bindings for prayer books whose plastic covers have been destroyed over time, but whose pages are still in good condition. Without new bindings, the books will have to be discarded. Here are two photos: one of the old, worn out covers, and one of the books with their new, Brettuns Village leather case bindings. Amateur, yes, but also quite beautiful! Thank you for your great leathers and affordable pricing. Ryan Mininger Goes to War! (torso, leg grieves, 2 full-arms, and a war skirt) as well as an additional torso piece....and I still have some left! We made great use of the scraps and I have included several photos below. In the group shot, I believe all of the helmets and any oxblood you see came from you. Our friends in Northern Michigan also ordered some oxblood from you. The helmets are from your thicker leather from a previous order. A pen made from leather. Now we've seen everything. Nice work by Paul Doxsss in Wisconsin. My journey with leather began 40 years ago and has evolved to incorporate rare stones and beautiful hardwoods. The viewer of this site can see another dimension of how this ancient medium can be used. The leather arrived last week and I worked intensely to make another bag, so fast, that I even had a day to remove the first attempt and tie in all the wooden parts to the bag. It's nice to know Calf hide works. I used some of the black leather as a welt for the edge seam. That looks nice with the oxblood. Once that was done I played it on & off all day Sat & Sun at our Renaissance Faire. We had either light or heavy rain both days. I got some rain spotting on the outside of the bag, which might dry out over the next days. It doesn't look like it was seeping moisture & gunk through the leather from within. The best is that the new bag really holds air well and makes playing as easy as it could be, and I didn't have to wait another week to put in into service. It's an English Great Medieval bagpipe made many years ago by Julian Goodacre in Scotland. Fred lived in Pennsylvania and was known for his archery shooting skills, as well as his fine custom leather work. The one on the upper right has real boar tusks and badger fur and a fully tooled strap that's been stitched along both edges with our leather cord. Tooling work like this takes literally hundreds of hours. All of these items were made with leather from Brettuns Village. We still get a real kick out of that. Beautiful leather journals - perfect for doodling! Nothing gives you a firmer grip on your bow when you are trying run an arrow through the boiler of a delicious animal than Brettuns Village Leather! Officer's hats and Shakos made with leather brims! The Spirit Bear is a website that features the work of Linda Pettersen. Linda knows how to make some incredible smudge fans, and she also knows where to buy her leather! Garth Thompson did one heck of a job with this great old chair. A nice leather vest and coat with antler buttons, made with leather from you-know-where. Stormy is a teacher out in Montana. This guy is covered in leather from head to toe, which we think is an idea more people should subscribe to. Stormy's artwork is incredible. Take a look. Hi, I wanted to tell you how great your Spur Fire cowhide was. I'm enclosing a picture of a bullwhip I made from it, and I intend to pick up a couple of more of these hides to make some more whips with. more than pleased with the quality of the leather AND the quality of your service. I've attached a photo of one of my knife/sheath combo's for you to see... and, if you know anyone who wants a great knife, send 'em my way...! "Raid Ye Not A Dragon's Lair... For Ye'd Be Tasty Medium Rare..."
Making Western Wear? So is Kathy Younger, only she makes it in sizes to fit small dolls! This gun belt would fit around a GI Joe or Ken doll, believe it or not. Don't pick a fight with these guys - they'll shoot you in the ankle. Then they'll ride away on these hosses and hide under your couch. Thanks, Kathy, for sending in these great photos. flexible clay and the darker gun belt that you can't really see here). Hmm, this is getting to be pretty fun. I just may be buying more from you in the not too distant future.I LOVE that rich pull-up leather, as you know. I managed to use every inch of it (I mean EVERY inch of it!) in order to make a miniature gun belt. The Colt was made by a blacksmith friend of mine. 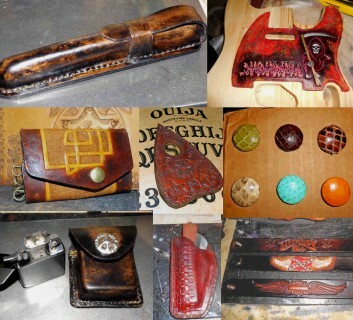 Instructional books, as well as providing leather patterns to make Custom Leather Boots. Wow! What a great idea - a leather chess board! Lauren Tenney made this work of art. as promised, here are the photos of the completed chess set. Thank-you for your incredible help in making this project possible. especially the pieces - was around 50 hours!! very worth it. I will be telling everyone crafty that I know about your site. Hi: We ordered a hide from you in November 2004. We covered an old Majestic Mighty Monarch radio with the hide. You mentioned that you would be interested in seeing the finished product. Here are some pictures of what your hides covered up. Theresa Szafran lives in Anchorage, Alaska and runs her own business up there making these wonderful booties. Her website is great - take a look! This is a photo of one pair of kids chaps I made from your Lipstick Red & Snow White leather. belt and I still have some left over. Shown on a buffalo skin from BrettunsVillage. I love you guys!!!! Now you know why I needed 160 1-inch rings. The leather was cut from a roll of that suede. Yep - that's all your stuff. Thanks for keeping me off the streets Churchill. Get your own tool kit right here. What do you do with a big pile of goat furs? Cover the La-Z-Boy, of course! Fellow Mainer Bridget uses our suedes to make shoes for her children. Great work! (Left image) I thought you might appreciate these ring-armored, leather bracers I made using your 5 oz. Hickory leather. This is part of an entire armor suite I'm in the process of completing. (Center image) The leather corset on my daughter (left) was made using the Olive and Sand nubuck I purchased from you and the corset on her best friend (right) used the Mocha and Cabernet nubuck. (Right) While most of my stuff is for our shooting gear or reenactment activities, this was a fun little project for my granddaughter, who loves three things in life: candy, purses, and her binky. So, she got this kid-sized purse with a "Binky Pouch" attached. A great looking headboard made by Andrew Stairs - a fellow Mainer! Thanks to Brettuns Village Leather's very affordable leather prices, I'm knocking out tons of projects. We sell at shows and request. All of the items are one-of-a-kind. Journal covers; belt bags; wood and leather boxes; key fobs; even a cat-o'-nine-tails (us flatlanders have weird ways of entertaining !). Thanks again and I look forward to ordering more of - everything ! a whip, visit my website http://www.wolfpitwhips.com. I cater to all age groups, and Sell whips for the sport of whipcracking only. Behold the amazing artwork of Rodolfo Morales-Miranda, who used our thick veg-tan sides as the canvas for his work. Rudy is stationed overseas as part of the military presence in Iraq, and he's a great customer of ours. We ship to him through his APO address using priority mail. It works out well - seems to reach him fairly quickly. Can you imagine the amount of hours that go into making something like this? Well, it's not like he can run out to the movie theater or the grocery store. E-mail Rudy for more information. Angie Allen made these excellent units for a pal in New Zealand. Brettuns Village Leather spans the globe to make feet comfortable. I am sending you some images of some leather armor I made from the buffalo leather scraps you sell. all day at the ren faires. I also make sword scabbards and belts and belt pouches. Also there are pictures of a shoulder bag from some split leather with matching vanbraces and quiver. wears in Hondo. Also made a rifle sleeve with bead work. It is lined with an ultra-soft blue fleece blanket. Just call Brettuns Village customer Jim O-Hanlon down in Florida and he'll bring his flame-throwing pistols over to your ranch. Whoa there, Jim - a bit heavy on the powder maybe. I'm the guy on the right.... Yep, I shoot only black powder cartridges and have a reputation for 'flaming' the competition. I am the Florida State Cap n' Ball cowboy shooter in 2003.
wore to protect their shirt sleeves from getting caught in a rope when 'dallying' the lariat around the saddlehorn). Shamrocks on these, too. (the canvas thingy you see in the photo). Thanks again for your great service. Beverly Amaral Customer for Life!